When daylight-saving time comes around, it’s tough to spring forward. We wanted to get ahead of the game this time, so we compiled the best tips from sleep specialists. 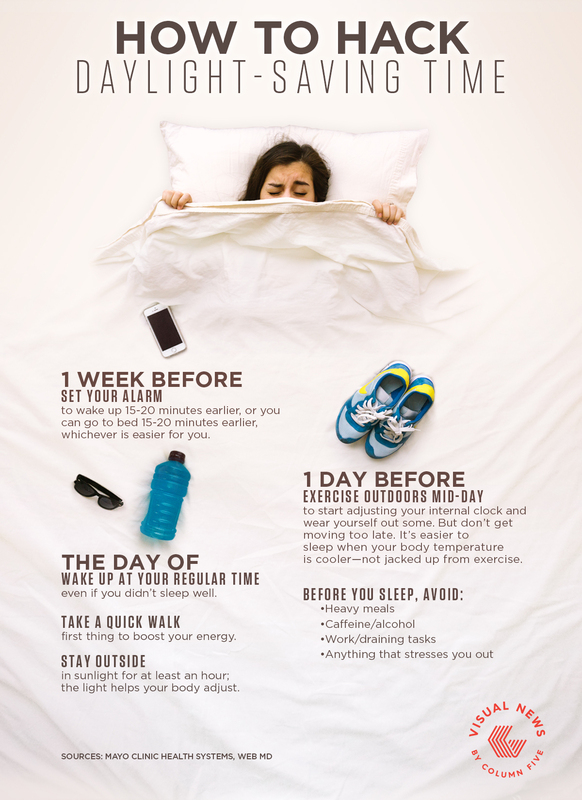 Check out this infographic to find out how you can hack daylight-saving time. Daylight-saving time is tough for everyone, but no one knows more about losing sleep than parents. We partnered with Pampers to visualize the results of their recent survey of parents with young children. What would most parents do for a good night’s sleep? Check it out. They say Millennials are apathetic and entitled. They say they’re too busy online to live in the world around them. But is that true? We partnered with Wellzoo to create this video, which shows the surprising side of Millennials. What are the biggest issues SMB marketers worry about? A global survey by The Economist Intelligence Unit found out. We partnered with Marketo to visualize the results in this infographic. Are employers looking at your social profiles? According to recent data from a Jobvite survey, they absolutely are. Check out this infographic to find out what employers consider to be red flags.